In such a fast-moving economy Opportunities & Threats emerge from the environment at such pace that an effective, resilient, ecosystem are prerequisites. Not since the dawning of the Industrial Revolution has the need for ‘organisational adaptability’ and agility been so apparent. What circumstances require business model innovation? via » Deconstruct and Innovate Your Business Model. Words of wisdom from one who knows. I read this in the context of my own industry [insurance] and my experiences of the last 10 years [the last 2/3 in particular] and recognise the lack of creativity. Too many business owners operate as “managers” who put too much effort into bemoaning market issues but lack the vision to create change and to fulfil the role of Leaders: in their own firms or in an industry that (like banking) has actively discouraged the invaluable input of contrarians. As a result they are doomed to do little more than play hard in a market of “me too” organisations, products and relationships! …we often shouldn’t seek to be really good competitors. We should seek to be really good monopolists. Instead of being slightly better than everybody else in a crowded and established field, it’s often more valuable to create a new market and totally dominate it. The profit margins are much bigger, and the value to society is often bigger, too. via The Creative Monopoly – NYTimes.com. Courtesy of years of unprecedented growth, we have an abundance of managers and an ’embarrassment’ of self-anointed leaders! So, before I re-state the need for innovation at every level in Financial Services (and across the “Economic domain”), I thought it would be useful to reprise the differences between the two – I can only hope that some of the self-anointed read this and start to live up to their own billing! …diminished trust in business leads political leaders to set policies that undermine competitiveness and sap economic growth. Business is caught in a vicious circle. INNOVATION is not a re-hash of processes, products, services or introduction of new technology, that improve the income capabilities of an organization without delivering tangible benefit to stakeholders. It is ‘destructive creation‘ that may improve short-term results but at the expense of long term performance. 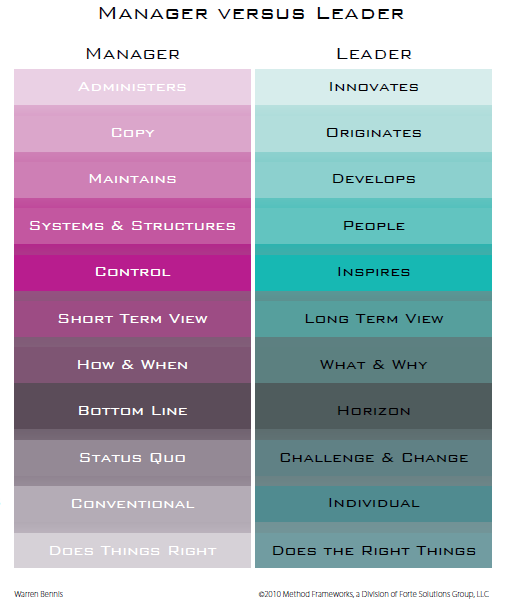 A LEADER, worthy of the title, will already have identified (perhaps even have begun implementing) changes, required to transform “inflexible” hierarchical management structures – that were adequate for the latter industrial era, into a structure able to respond to and exceed stakeholder needs in the Digital Age. Where are these people? I want to hear from them! I want genuine business leaders who have the desire and ability to become RISK LEADERS. To create competitive advantage for their own organisation and to contribute to (re)building systemic resilience for survival in volatile and uncertain times. 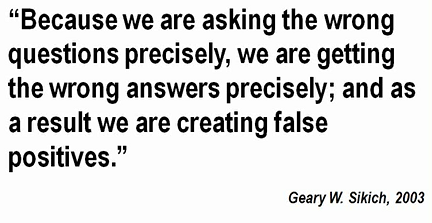 If guys like Clay Shirky and Seth Godin “did” economics we wouldn’t be in the mess we are in now! These guys don’t think about critical issues in the conventional, College-taught, manner of an unreal world. They focus upon the world AS IT IS, AND NOT HOW WE CONVINCED OURSELVES IT WAS! No wonder many of C-level Exec’s and institutions, that thrived in the industrial era, are “failing” in the Digital Age, when so much of what they held dear and used as justification for excessive remuneration and bonus packages, have been shown to be deeply flawed: economics; financial and risk management. Some do claim that they are now looking to “innovate” their way toward a brighter future but the evidence suggests that their idea of i-nnovation is more about re-packaging the same old “win/lose” propositions: destructive creation!